Naropa (Tibetan; Sanskrit: Nadaprada, 1016-1100) was an Indian Buddhist mystic and monk, the pupil of Tilopa and brother of Niguma. Naropa was also Marpa’s teacher. Naropa is a lineage holder in the Tibetan Buddhist Kagyu lineage, and was considered an accomplished scholar. A great meditator, is best known for having enumerated and developed the six yogas of Naropa. These practices were designed to help achieve a more rapid attainment of enlightenment. Many subsequent Kagyu Karmapas have been particularly adept at one or more of these six yogic practices. 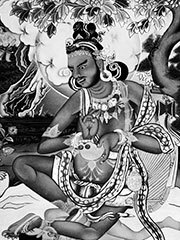 Naropa was the best-known student of the Indian sage Tilopa. He declined to follow his father’s trade as a liquor-seller. After attaching himself to Tilopa, he was harshly-treated by his teacher over a period of twelve years; he was repeatedly rejected and chastised, despite his model conduct as a devoted student. He is considered one of the eighty-four mahasiddhas, the ‘saints’ of tantric Buddhism. Naropa University is named in his honour.